Carl Hough lost six stone by cycling. 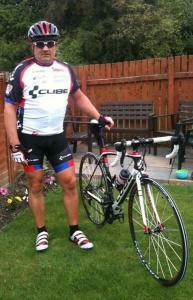 After taking up cycling, courier Carl Hough from Alfreton has lost over six stone. Now a fully trained 'Sky Ride Local' leader, Carl aims to inspire others to discover the benefits of cycling. I was in the Forces from 1992 until 2004 so I was doing plenty of physical activity. When I came out I started working for myself as a courier. I was behind the wheel all day, getting very little exercise and eating at road side cafes. 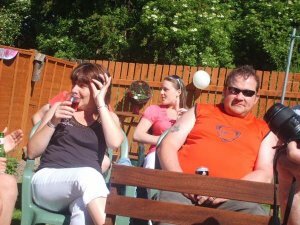 Year on year I started to pile on the weight and after eight years I'd put on six stone. Carl reached a tipping point. The crunch came after Christmas 2010. I was finding it increasingly hard to bend down and put my socks on in the morning. I'd gone up to 20 stone and couldn't fasten my size 38 trousers. My wife said she'd buy me a pair of size 40s but something flipped inside my head and I said, 'No way'. So she told me to go to Decathlon and buy a bike. It wasn't the ideal time – it was January so it was cold and dark but I started cycling two to three miles on my own every night. I'd cycled as a youngster but nothing serious since then and that was all I could do. Since then, I've lost six stone and have built up to cycling around 150 miles a week. Now I'm going out for rides of at least 25 miles a time, and often more. I've always been a big lad, but I'm probably back down to my army weight of around 14 stone. Carl is now a ride leader. On a Wednesday night I go out with a group of friends called the South Normanton Nomads. But most of my riding is done at the weekends. 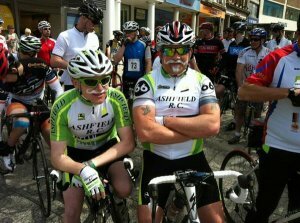 I'm affiliated to Ashfield Road Club and we do around 100 miles on a Sunday morning. It's a club that's steeped in history with quite a few members who've turned professional. Basically I've gone from a zero cyclist to signing up for my UCI (cycling's governing body) licence, so I can start racing. My longest ride to date was 187 miles from Alfreton to Skegness and back in 17 hours with around 12 hours of ride time. I wanted to give something back so when I saw an email from British Cycling about leading local rides, I thought, 'Why not?' I started leading rides in and around Derby to inspire those who want to get back into cycling but don't have the support they need to get back on their bike. As a ride leader I've been trained to guide local rides and provide lots of advice and support to everyone that attends. They enable you to build yourself up from an easy ride to a steady or more challenging guided ride and they're only ever as fast as the slowest rider so no one gets left behind. They are a fantastic way to meet new friends or like-minded people and the easy rides make the perfect family outing. I've got a lot out of it. Now I'm jointly leading rides on the Sky Ride Local programme. I simply love getting out on my bike, helping others discover their passion for cycling and the range of health benefits and freedom that comes with it. You can also click here to follow Carl on Strava and read Carl's top biking tips for riding back into shape.